Philaret was from the village of Amnia in Paphlagonia. Early in life, Philaret was a very wealthy man, but by distributing abundant alms to the poor he himself became extremely poor. However, he was not afraid of poverty, and, not heeding the complaints of his wife and children, he continued his charitable works with hope in God, Who said: Blessed are the merciful, for they shall obtain mercy (Matthew 5:7). Once, while he was plowing in the field, a man came to him and complained that one of his oxen had died in the harness and that he was unable to plow with only one ox. Philaret then unharnessed one of his oxen and gave it to him. He even gave his remaining horse to a man who was summoned to go to war. He gave away the calf of his last cow, and when he saw how the cow pined for her missing calf, and the calf for the cow, he called the man and gave him the cow too. And thus the aged Philaret was left without food in an empty house. But he prayed to God and placed his hope in Him. And God did not abandon the righteous one to be put to shame in his hope. At that time the Empress Irene reigned with her young son, Constantine. According to the custom of that time, the empress sent men throughout the whole empire to seek the best and most distinguished maiden to whom she could wed her son, the emperor. By God's providence, these men happened to stay overnight in Philaret's house, and they saw his most beautiful and modest granddaughter Maria, the daughter of his daughter Hypatia, and took her to Constantinople. The emperor was well pleased with her, married her, and moved Philaret and all his family to the capital, giving him great honors and riches. Philaret did not become proud as a result of this unexpected good fortune, but, thankful to God, he continued to perform good works even more than he had before, and thus he continued until his death. At the age of ninety he summoned his children, blessed them, and instructed them to cleave to God and to God's law, and with his clairvoyant spirit he prophesied to all of them how they would live out this life, as once had Jacob. After that he went to the Rodolfia Monastery and gave up his soul to God. At his death his face shone like the sun, and after his death an unusual, sweet fragrance came forth from his body and miracles took place at his relics. This righteous man entered into rest in the year 797. His wife, Theosevia, and all his children and grandchildren lived a God-pleasing life and reposed in the Lord." From the wealth of your faith in God, You distributed your riches to the poor, O Philaret. Your life was adorned with compassion And you glorified the Giver of mercy. Implore him to have compassion and mercy on those who praise you! You possessed the spirit of Job in temptations, And compassionately distributed your wealth to the poor. 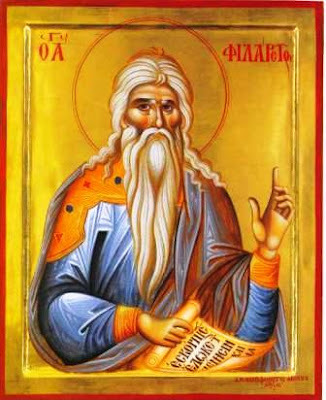 You were a living fountain of almsgiving, And by your manner of life you gladden those who cry: Rejoice, O Philaret, servant of Christ God! St. Philaretos, intercede for us! I thought you might like an Akathist to St. Philaret the Merciful. He is an ancestor of mine..on my mother's side. It is truly amazing..and I am proud.